HVP, the company who grow and harvest timber in the area, have revegetated areas adjacent to all the waterways (not to be harvested) which run through their plantations with indigenous native plants. To protect the plants against rabbits, etc. 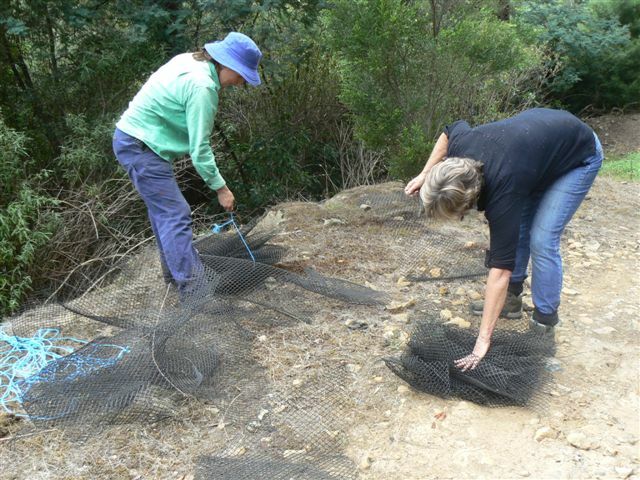 plastic mesh tree guards were installed. Now that the trees are several years old the tree guards are no longer required but funds are not available to remove these guards. This years guard removal day was held on the 18 March. Jenny found what must have been the hardest spot to remove guards from - steep, crumbling soil, and almost impossible to shift the rolled bundles of guards uphill. It got very humid down by the creek in all the vegetation, and included a few leeches. Once again got a good ute load of guards which have mostly been sorted, good ones going to Jenny's place for reuse and the broken in destined for recycling at the tip. But - and there is mostly good in with the bad - the lunch spot was a beautiful break, warm and sunny and then Jude spotted a HUGE yabby! 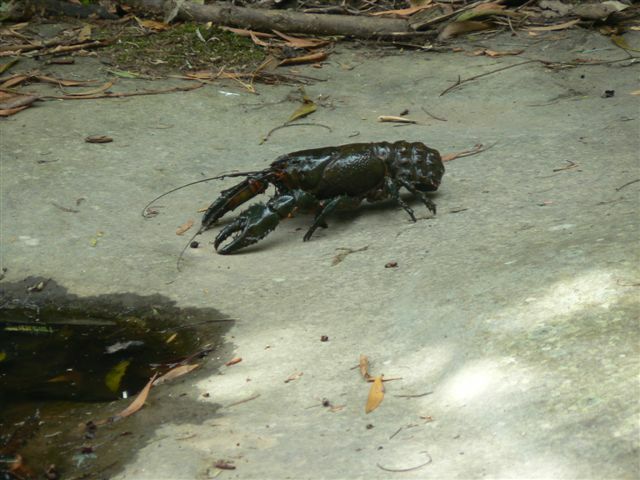 Cherax destructor - he/she must have been about 25 - 30cm long and would have made a lovely lunch on its own I reckoned! We followed its progress right along the rocks until it re-entered the water again. Magnificent. Jenny and Jude tying up bundles of guards. Yabbie. 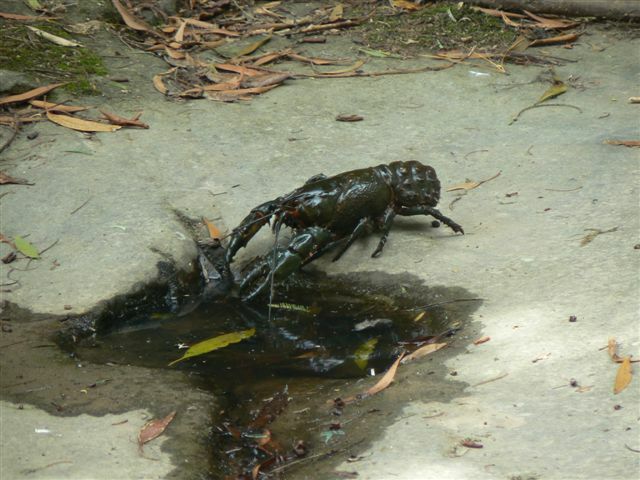 Cherax destructor - too late for lunch! 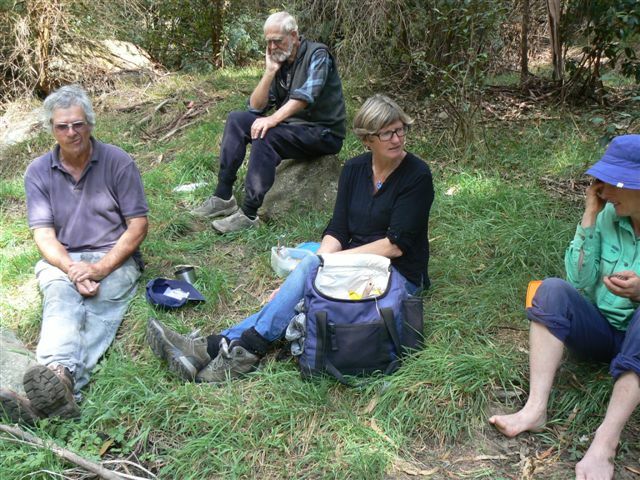 Dallas, Roy, Jude and Jenny taking a well earned lunch break.